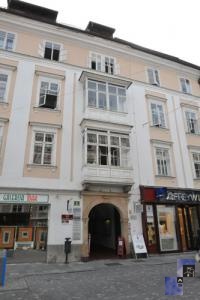 This attractive, two-storey apartment is located in the heart of the historical city centre, on an excellent location right by city attractions, famous Baroque Robba’s Fountain and Town Hall Rotovz in a traditional building on Mestni trg. 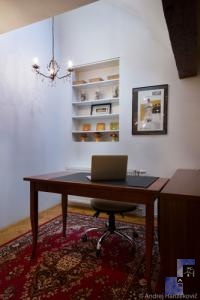 The apartment is situated on the 3rd floor of a renovated traditional building without elevator access, because the building is under heritage protection. 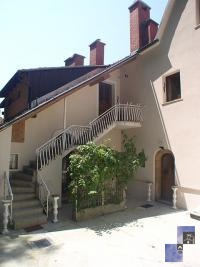 It is a spacious duplex, newly furnished. 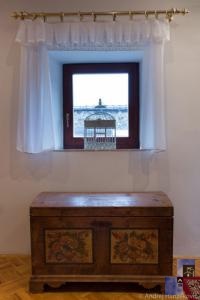 On the first floor there is a furnished kitchen with a refrigerator, dishwasher, stove and an oven, a dining corner with a table for 6 persons, a living room with a leather couch and settees, another pull out sleeper sofa (140 x 200 cm), writing desk, an exit to the terrace with a castle hill view and a bathroom with a shower cabin. The washing machine is in the hall at the entrance. 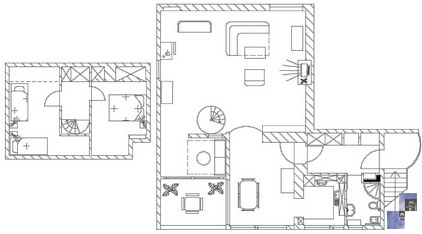 There are two bedrooms on the 2nd floor, one has a bed (140 cm x 200 cm) and the other one two singles (90 x 200 cm). The apartment is equipped with cable LCD TV, CATV, free broadband wired and wireless (Wi-Fi) internet access, telephone and an air-conditioning system. The private parking lot is approx. 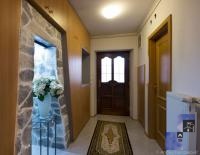 450 m away from the apartment (only for personal vehicles that do not exceed the usual size of 5m) - daily price is 12 €, monthly price is 120 €. Reservations must be made in advance.